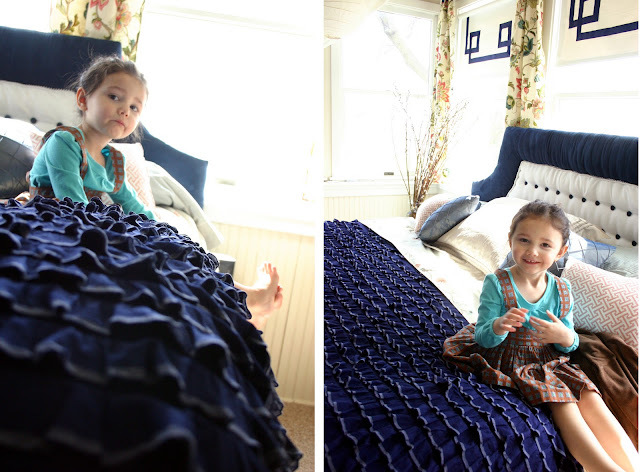 For this duvet I used a preruffled fabric from Ruffle Fabric in Navy 2" ruffle with white stripe. She has some new peppermint ruffle fabric that to die for. I'm kind of glad she doesn't have it in blue and white because I might lamented missing out on it. Love love love her stuff! 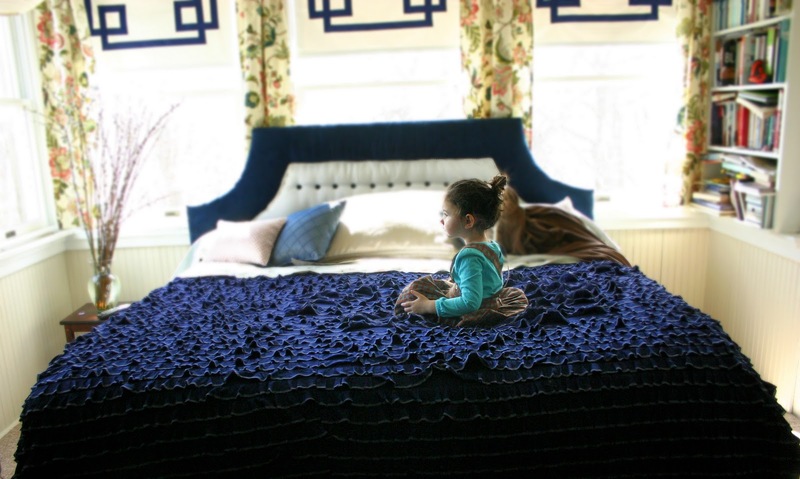 Ruffle fabric makes for great instantly amazing projects. Use for pillows, curtains, even clothes! Some other items you should check out are her white ruffled maze fabric, blue bell cascading ruffled fabric and 2" taupe ruffled fabric. For my king sized bed I used 6 yards of ruffle fabric and a king duvet insert from JoAnn's that was on sale for $20. For the back of the duvet I used a king sized 650 thread count sheet and as a fold-down contrast I used a vintage floral twin sized sheet with similar colors in the room. I also made decorative pillow for the bed. I bought the pillows at the thrift store for just $1 each. I found some AMAZING satin teal diamond pleated material from Hancock Fabric for only $7! I'm thinking of going back and buying the rest of it. You can't see them very well but I also purchased pink deco fabric from JoAnn's and covered two small rectangle pillows. The pink was a nice accent to the pink in the curtains and the contrast fold over vintage sheet. You'll have to cut your yardage in half and sew them together lengthwise. That is just super cute. Loving her fabric. May have to get some of the peppermint ruffles for christmas outfits. I have been drooling over that ruffle fabric for ages - I just need to buy some, for heaven's sake! Love love love the duvet! LOVE! must have... ruffles are the best. Lovely! I like the ones urban outfitters has, but they are pricey. Would you mind showing a bit of the backside of the duvet? It's gorgeous! Love that ruffle fabric! Well that is just FABULOUS! 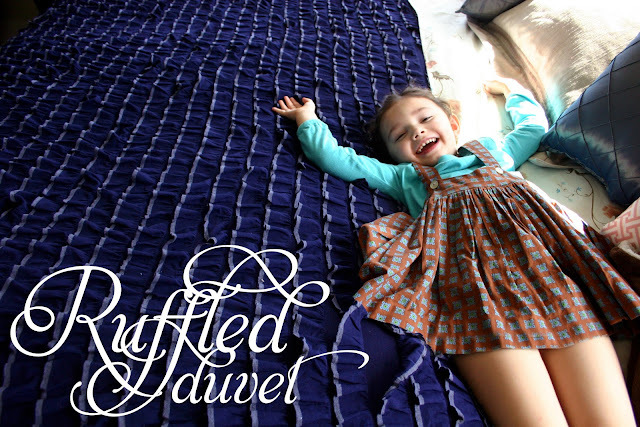 I love all things ruffled...might have to make a duvet myself! That colour is perfect! And ruffles too! Oh my goodness, how fabulous! I missed your bedroom makeover entirely. Off to backtrack and see the rest! I love this! I've been looking for white ruffle style bedding and I can't find it for a good price anywhere (online). I think I'll have to try this out with the white ruffles she sells. I'm kind of confused about how you sewed it together though? What do you mean about cutting the yardage in half? Can you give more detailed instructions? Thanks! You room is beautiful! @~Crystal~I took the six yards and cut it into three yards. Then I took those three yards and sewed them together lengthwise. That means if your fabric is 45' wide, you would now have a 90' piece of fabric that was 3 yards long. I need to ask where the ruffle fabric came from? Hancocks? Joann Fabrics? Someplace else? Your daughter is pretty much the most adorable little girl that I have ever seen. I have been wanting to do this for months!! How did you hide the seam in the front? Or does it just lay nice and you can't tell that you sewed two pieces of fabric together? I worry about it looking obvious that there is a seam down the middle where the ruffles are separate. @EmilyCorrect. I just laid it nicely so that the ruffles didn't bunch and it's not really noticeable. Maybe it helps that I used a dark material? Where are your curtains from? So cute!